Luke had his MRI today on his knee. It is too early to get the results, but the photos are cool. 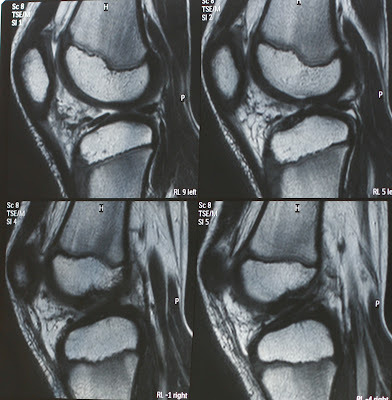 We have various cross-sections of his knee from all different angles. Luke was AMAZINGLY well behaved in the MRI. He showed so much maturity. 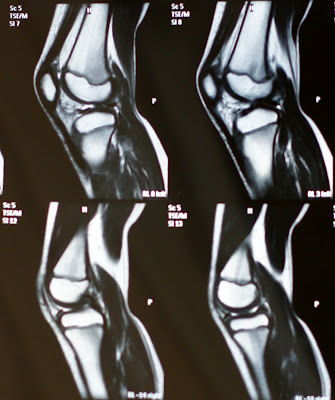 The problem with an MRI is that if you move, even a fleck, you ruin the MRI. As such, they had a special "abort" button for Luke to push if he had an itch or had to move. After Luke had been in the machine for 15 minutes, he began to have an insatiable itch, and was just about to push the button. However, as he told me, he knew that pushing the button would mean he'd have to start over, so he just sucked it up and finished the MRI. The technician said he behaved very well, especially for a kid. We'll be anxious to know the results, hopefully next week. The images are absolutely amazing! I would have recognized Luke anywhere, such a likeness. I'm eager to hear what they found. 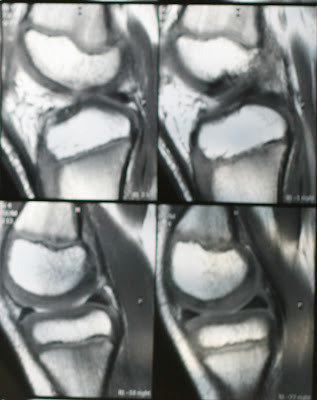 I think that is the first MRI that I ever saw of a knee. I hope you get the results soon!